Imagine a very important religious subject. 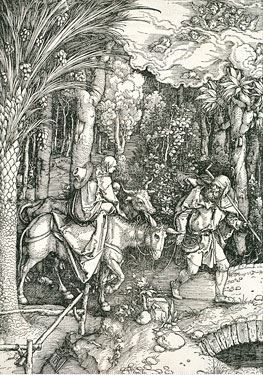 Now go back a thousand years, and think of a thousand ways of portraying three figures and a donkey. Ran out of options at #999? Not if you’re Jehangir Sabavala. 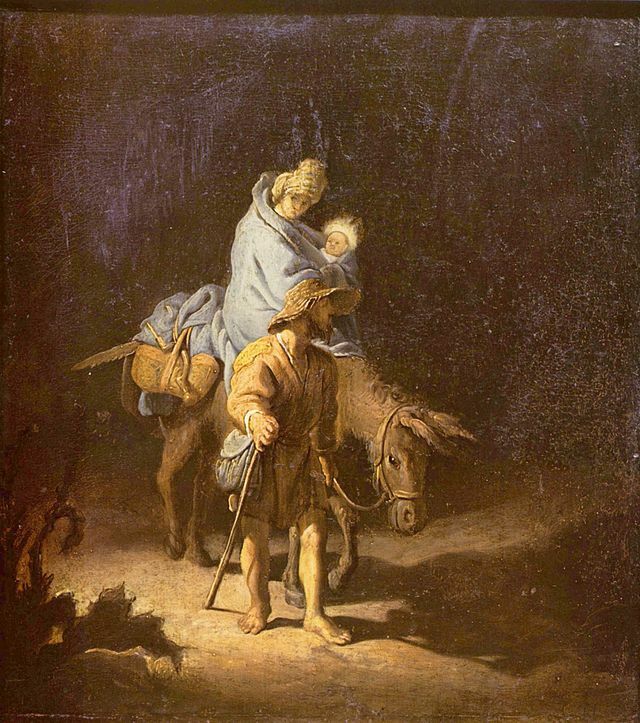 What lies Beneath: …Joseph and Mary’s Flight into Egypt, mentioned in the Bible. 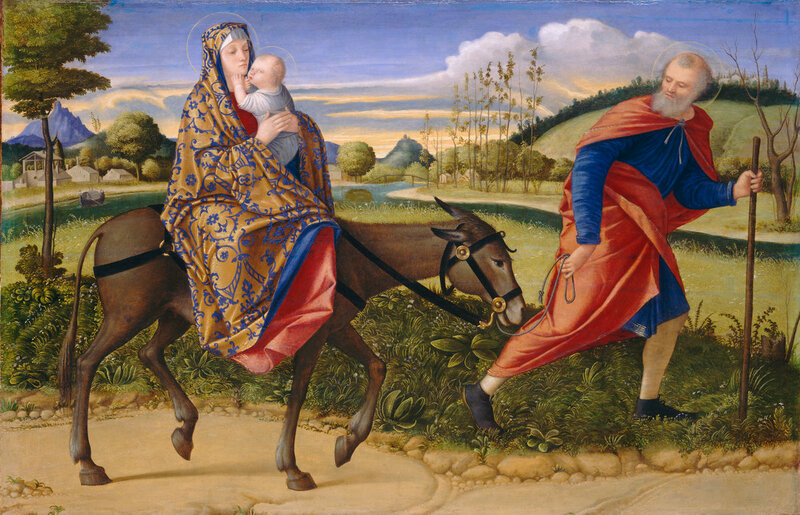 They’re fleeing with baby Jesus from Bethlehem, after learning about King Herod’s plot to kill all infants in the region. Ahhhh I see, you say. So those two—no, three figures are negotiating dangerous paths and curves in the hopes of surviving this evil king. How wonderful, it suddenly makes sense. But no. It doesn’t end there. Question: What, there’s more to it? The Story Goes: So let’s go back in time some nine centuries or so *plays that groovy song by Huey Lewis and the News*. You’re in the year 1145, at the Abbey of Saint-Denis, France, and you see this lovely stain glass depiction of the Nativity. Here you witness baby Jesus in full glory, commanding a palm tree to bend so tired, hungry Mary can pluck a fruit off it. And of course, befitting of a church window, they’re both haloed. 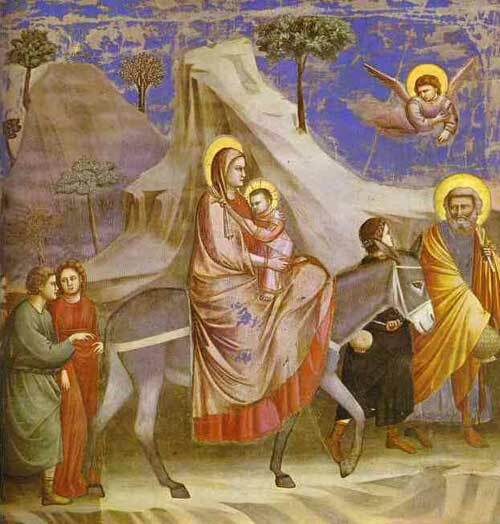 Giotto di Bondone’s Flight into Egypt, executed as a fresco for the Scrovegni Chapel, Padua, Italy. You find yourself in the year 1515. Oil paints are in. There’s definitely more depth to this painting than there was in Bondone’s, and the fabrics and figures bear closer semblance to reality. The halo isn’t bright anymore, but appears as a faint rim around Mary, Jesus and Joseph. The painting appears brighter, more positive, owing to the rich colours. The focus is still on the figures. They trudge on against a twilight sky. Coming back to the present—which you will do later—you learn that the National Gallery of Art, Washington D.C., suggests that “it was made for a religious confraternity”. Maybe it was just a fad in Italy, you reason. Okay, let me take you to Germany, and rewind to ten years prior. Dürer’s 1505 depiction is full of detail—crammed with it, and there is a nebulous presence of fear and urgency in the work. 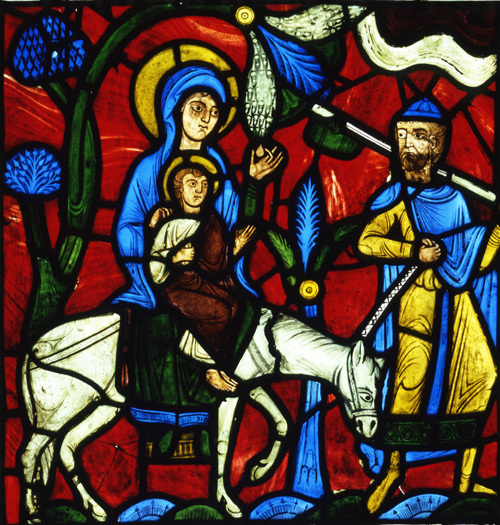 Mary holds Jesus on her lap, slightly slouched on the donkey. Joseph appears to be carefully turning around to check on them. Stealth and clandestineness matter here. But yes, the focus is on the figures. You’re now in 1627, the age of Baroque/Dutch splendour. You’re viewing Rembrandt’s version, with the light dramatically falling on the three figures assuming centre stage. It looks like a scene out of a play—a huge, huge turn from the preceding works. You feel like you’re in the midst of the drama, but with the focus again on the figures, you feel like they’re never shaking off the past completely. Move ahead 252 years. 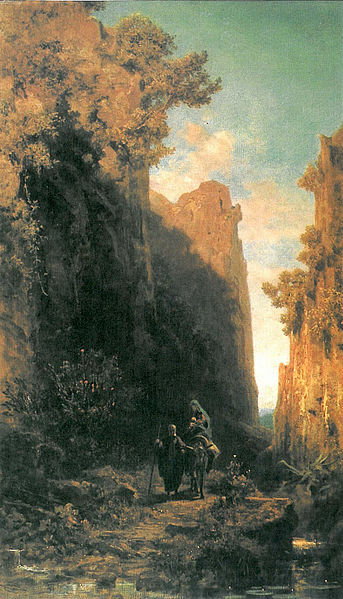 Soaking in the Romanticism of 1879, you see Spitzweg’s Flight into Egypt. So now it’s larger landscape + smaller figures, you observe. You’re quick at noticing how the landscape dominates the work. Joseph, Mary, Jesus and the donkey are diminished in size in comparison to the steep ravines behind and around them. Spitzweg has either captured or chosen to portray a calmer part of the flight through his shading and tinting. Closer to a recognisable timeline, you’re in 1923, and you stumble upon famed African-American artist Henry Tanner’s version. You quite like Tanner’s version, it’s refreshingly different in its treatment. You especially like that the figures and the path before them are illuminated by a lantern in the painting, rather than a divine source. 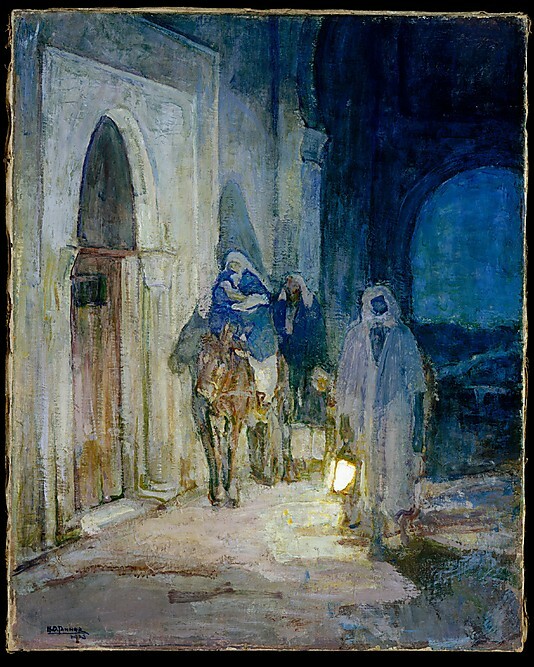 …at Sabavala’s Flight into Egypt-I. And you’re back in 2014. Sabavala avoids the glory of religious icons, the vibrancy of colour, the assurance of a recognisable face. His figures aren’t wasting time. They’re on the move, working their way carefully around towering ranges, riding to a distant land. You understand how dangerous this mission is. You feel it in his clever use of angular forms, his use of greys and browns to convey the mood. All that initial enamour you shared for colour, light, beauty have you second-guessing. Sure, they’re present here, but their function is so different. Here, the trio are in mortal danger. Their concerns are very much human, and you can feel a bond with them.